Fine. 028942021020 This item is guaranteed to play perfectly with all original artwork and materials. U.
Wolfgang Amadeus Mozart. Very Good. In very good packaging. 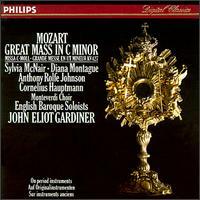 Monteverdi Choir-Mozart: Great Mass in C minor /English Baroque Soloists · Gardiner by Monteverdi Choir.